The Freedom Is Internal Collection is a creation of the pioneering methodology Veronique first implemented in 1989. 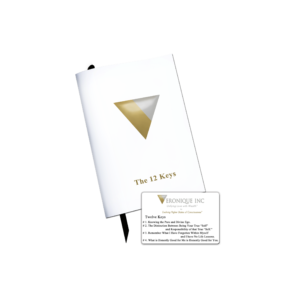 The Collection contains four foundational tools that reflect and systematically peel away subconscious and conscious beliefs that defeat your goals and aspirations. Once this occurs you become empowered to shift these influencers into a clarity and self confidence never experienced before. Each tool then provides a simple ‘HOW’ you can continue to empower yourself into ever greater means of being able to more easily live what your heart and soul guides you towards by simply being yourself. Through the Methodology, you begin to realize that happiness is not dependent upon your bank account, yet you come to know you are worthy to have whatever size bank account you want because you understand that the ease of creating the size of your bank account is based upon your happiness, and not the other way around. Through the power of the wisdom & science within this Collection, you are able to grow into the knowing and ‘be’-ing that you don’t ever have to sacrifice or give anything up to have what you truly desire in life if you’re truly willing to be responsible for actions made by being unconditional and absolutely accountable for your choices. Once you start using this methodology, you have made a statement – to the universal source – that you have chosen to create your life through the responsibility of being your Love. You would not have come across this material if you were not ready for this leap of being aware and using love over anger/fear. At this point you can still choose anger/fear over love, (you always have a free will choice), yet you have reached the point of no return and will no longer be able to create through anger/fear without creating damaging effects on your’s and other’s lives via the Karmic effect of what you choose to ‘create through’.